Then, too, Jesus had been up the rest of the night without sleep enduring beating, cruel mockery and unspeakable brutality. The next morning, the Romans scourged Him. (Mark 15:15, John 19:1). Jesus was already greatly weakened when he carried his cross, stumbling, to the place of crucifixion alongside the main public highway, probably just outside the Damascus Gate. If we now consider the nature of time and eternity (see Arthur C. Custance, Journey out of Time, Ref. 2) it must surely become clear that what was (for us) three hours' suffering by Jesus in total estrangement from the Father---was for Jesus an event in eternity which never ends. The work of Jesus on the cross, as far as we are concerned, is completely finished. Jesus is not now hanging on a cross. He has been raised from the dead, and sits in heaven, fully in charge of the universe as a resurrected man. One man, one son of Adam, Jesus the Lord is now living in glory and He is in charge of the universe. According to Ray Stedman, a little reflection on the nature of God, for God is love, makes it clear that maintaining hell must be a terrible torment and pain to a God who is self-giving love. He is the Holy One who "takes no pleasure in the death of the wicked," and who "is not willing that any should perish." God must be willing, therefore, to pay the price of His own eternal pain, suffering, and hell so that the few who are righteous, (by faith), might enjoy eternal bliss. Such is another aspect of the mystery of the suffering of Christ on the cross. Most of us are accustomed to thinking that we suffer more than God, and that He surely cannot fully identify with our minor pains and afflictions. Crosses in Romans times were usually made from old trees and old branches since lumber was scarce. as noted at the beginning of this article. Hundreds of people were regularly killed slowly and painfully by the Romans in this way--while being exhibited in public . Our modern nicely finished and varnished wooden crosses are far from the horrifically terrible and ugly reality of real crucifixions. When someone violated t he Law of Moses in a serious way and was put to death, his body was publicly displayed by hanging the body on a tree. This was an ultimate disgrace, especially for the Jews. Notice how this reference to hanging on a tree is applied to the death of Jesus in the New Testament. Jesus, the innocent, sinless Lamb of God was MADE to be sin for us, and punished for our sins, thus He became cursed on our behalf--suffering the ultimate shame, humiliation and disgrace of being hung on a "tree". (See Acts 5:30, 10:39, 13:29, 1 Peter 2:24, Galatians 3:13). "Who has believed what we have heard? And to whom has the arm of the LORD been revealed? For he grew up before him like a young plant, and like a root out of dry ground; he had no form or comeliness that we should look at him, and no beauty that we should desire him. He was despised and rejected by men; a man of sorrows and acquainted with grief; and as one from whom men hide their faces he was despised, and we esteemed him not. Surely he has borne our griefs and carried our sorrows; yet we esteemed him stricken, smitten by God, and afflicted. But he was wounded for our transgressions, he was bruised for our iniquities; upon him was the chastisement that made us whole, and with his stripes we are healed. 2. An important paper by Dr. Arthur Custance on time and eternity is very be helpful, The Complexities of Time. The aspects of time and eternity as they enter into the sufferings of Christ on the cross are discussed in detail in Journey out of Time. See especially Chapter Five, When Time became an Eternity. Custance concludes with the following quote from John Gill (1697-1771), "When He was made sin and a curse...it was tantamount to an eternal death, or the suffering of the wicked in hell. For though the two kinds of suffering differ as to circumstances of time and place, the persons being different, the One finite and the Other infinite, yet as to the essence of these sufferings, they were the same. Eternal death consists in two things: Punishment in the form of deprivation, and punishment in the form of actual affliction. The former lies in an eternal separation from God, or a deprivation of his presence for ever: and the latter lies in an everlasting affliction in the everlasting fire of God's everlasting fire of God's wrath. Now Christ endured what was answerable to both of these. Eternity is not the essence of punishment but it is consequent of the fact that the sufferer cannot all at once bear the whole - being finite as sinful man is finite. And as it cannot be borne all at once it is continued ad infinitum. But Christ being an infinite Person, was able to bear the whole at once and the infinity of his Person abundantly compensates for the eternity of the punishment." An excellent discussion about pain and hell is presented by C.S. Lewis in his book, The Problem of Pain (Macmillan Publishing; New York, 1962). 7. See How God Saves Us. In a sense, the Christian is baptized "into Christ" before Christ went to the cross, instead of after Christ's resurrection. On the cross, our sins were transferred to the Lord who was our sin-bearer. But at the same time we were also crucified with Christ. This was necessary so that our old Adamic nature could be put to death once and for all. (These specifics are discussed in Romans). Of course there is deep mystery as to the connection between our present-time and eternity and the transfer of our sins back into the past 2000 years to Christ's finished work on the cross. How are we identified with Christ on the cross when long before we were born? In order to make the most informed estimate, we need to examine the Sabbath. The original Hebrew word "Shabbat" is defined as: an intermission, the day of rest, the holy seventh day; a week (Leviticus 23:15 [cf. Deuteronomy 16:9; Matthew 28:1]), the sacred seventh year, a sabbatical year. Proponents of a Thursday crucifixion might argue counting a partial day for Thursday (the crucifixion), a day for Friday, a day for Saturday(day) and that Jesus arose just after sunset at the beginning of the fourth day which would not be counted. In addition, there would be three full nights in between as well. So Thursday can be argued from the Scriptures. One of the problems is reckoning "three days" between Friday evening and Sunday morning. I was once co-hosting a national TV show which had the famed apologist John Warwick Montgomery as a guest. This issue came up, and John rendered the traditional rationalization, pointing out that the Jews reckoned a partial day as a whole day. I turned to my co-host and explained, "You must remember that John is an attorney, and that's the way they bill!" Good Friday is the "traditional" view. 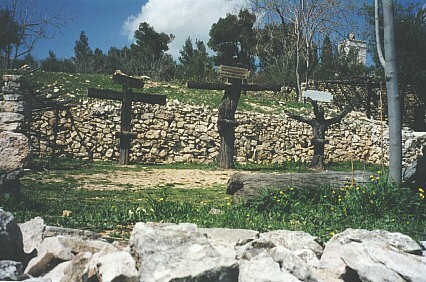 The Wednesday crucifixion is known as the "reconstructed view." This article is intended to stimulate study and constructive conversation during this precious season. One attempt to reconcile the chronology of the entire week is shown in the table below inset boxes [Friday-Tuesday] and [Wednesday-Sunday]. John 19:14, 31, 42; Mark 15:42; 54. Matthew 27:62; Leviticus 23:6,7 (Jewish year includes seven high sabbaths, in addition to the Saturday sabbaths.